When life gives you wild turkeys, make wild turkey broth. 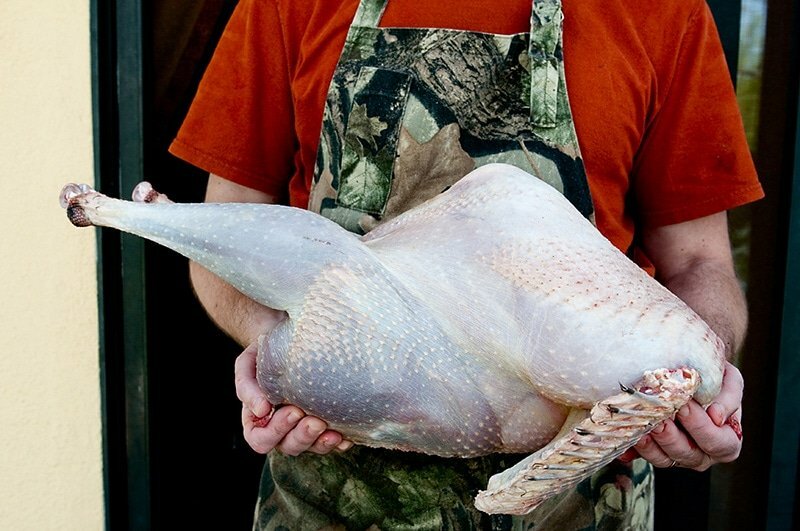 Most of us bring home only a few wild turkeys in any given year, so you owe it to yourself to make a nice broth from the carcass. You can make broth from a skinned or plucked turkey, and you can either use the wings in this broth, or save them for another recipe; either is fine. You can also use a cleaned gizzard and the heart if you want. Incidentally, I am calling this turkey broth and not turkey stock because it is rich enough to use on its own. It would be a great broth for tortellini. I set the turkey stock to a simmer for 8 hours, or overnight. I don’t let it boil. With 90 minutes to go, I add the vegetables, herbs and some crushed up, dried mushrooms. Any kind of mushroom will do. It adds a savory note to the broth. Strain your broth through a paper towel set in a sieve that is itself set over another pot or a large bowl. Then you ladle the broth through this instead of pouring it all through. Why? This keeps the broth very clear, almost as clear as a consomme. I only add salt after I strain. Or, you can simmer the broth down until the ambient amount of salt in it tastes right. 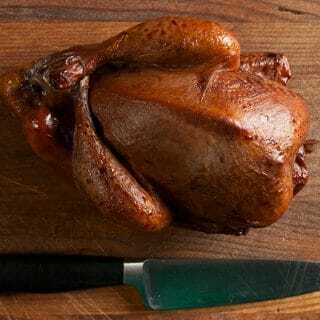 A typical wild turkey will yield 3 quarts of broth. A big store-bought up to a gallon. Again, this is way more of a rich broth than a base stock — golden, clear and oh-so full of turkey goodness. This turkey broth can of course be done with a domestic turkey; the two are not so different, although you will get a better broth with a better turkey. The key to this broth is to not let it boil, and to let the carcass cook for a long time before you add the veggies. 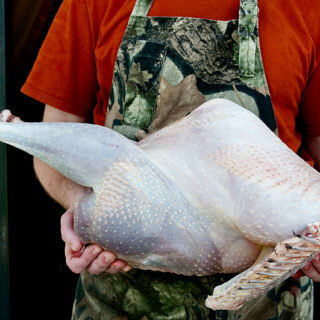 Break up the turkey carcass into large pieces so it will fit in the pot. Use the largest stockpot you have. If you have not cooked the turkey already, roast the carcass with a little oil and salt at 400F until it is nicely browned, about an hour. Or, you can make a lighter broth by covering the uncooked turkey carcass with water, bringing it to a simmer (not a full boil) and skimming off any scum that floats to the surface. Do this for 15 minutes or so and then proceed. Let the turkey simmer very gently -- you want the surface of the pot to barely shimmy, not bubble much at all -- for at least 2 hours and up to 12 hours. When you want to finish your broth, add the vegetables, herbs and mushrooms and simmer gently for another 90 minutes. To strain, set a paper towel in a strainer and put the strainer over another large pot. Ladle the broth through the paper towel to filter out any debris. You might need to change the paper towel midway through the process. Now you can either add salt to the finished stock or jar it as-is. If you plan to freeze the broth, leave about an inch of headspace in the jar, otherwise the expanding broth-ice will crack the glass. You can also pressure can this stock. 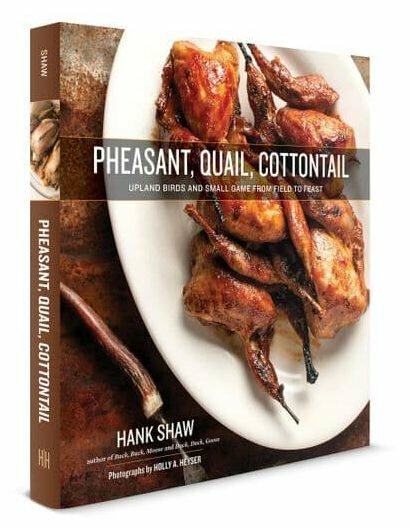 YOu can find many more wild turkey recipes, as well as recipes for other upland birds, here on Hunter Angler Gardener Cook. How exciting to get a wild turkey. They are very very tricky. I can’t wait to read more about the use of the meat. The real keeper is plucking the feathers… Way to go! Hi Hank! I think it’s great that you used all of the bird…no waste! The stock looks wonderful and rich. Thanks again for joining us for Grow Your Own! This recipe does not disappoint. Though I love fennel, I only used 1/3 of the bulb. The resulting broth was amazing! Thanks, Hank!